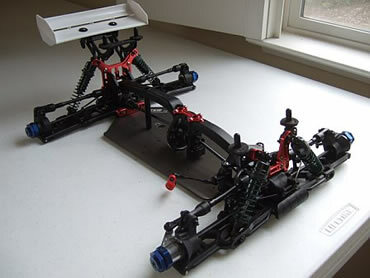 I thought that I was going to be good and sell some of my RC cars that I do not play with. So, I posted an ad on RC Universe to sell both my Xray FK05 with all the parts and etc. Then this guy in Georgia sends me a PM and asks if I was willing to trade everything for a Brand New CEN Matrix TR Arena - Factory Race Edition. Tell you the truth I have no clue what that is.. I was curious about what this guy has to trade so; I went on to google and search for CEN Matrix TR Arena - Factory Race Edition. After reading a few reviews and message borads, the Matrix TR seems to be a good 1:8 scale Truggy. Plus, Tower Hobbies still sells this truck for $489.99. The only problem is that the truck is a rolling chassis (no body, wheels, engine, electronics, and etc). To sweeten the deal this guy also threw in 3 brand new set of tires, 2 brand new body (1 painted, 1 unpainted), 17mm hex adapters, yellow wing and what ever misc. parts that comes with the truck (clutch bell, shock spacer, manuals, DVD). Initially I was hesitant about this trade, because I am giving him 2 car with a lot of parts and he is just sending my one. I agreed to trade him because I always wanted a 1:8 scale car. I received the package yesterday and I am glad to have made the trade. Everything came in exactly as he described, basically everything was Brand New! The next step is to convert the Matrix roller in to a brushless monster. Because of my consent browsing of ebay for deals I have all the electronics need just lying around. 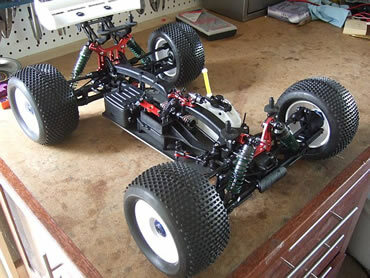 Even though the Matrix TR is a 1:8 scale truck, it is about the same size as the E-Revo. 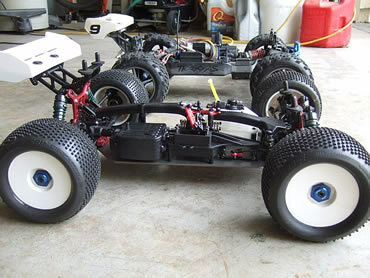 The E-Revo might look a little wider because I have 1 inch wheel extension on each side. 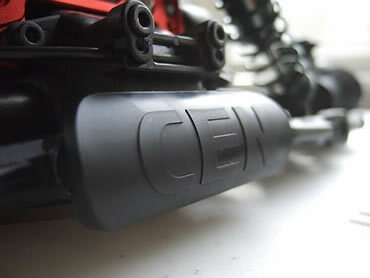 As for the CG for the Matrix TR (front), it is defiantly a lot lower than the E-Revo (back). 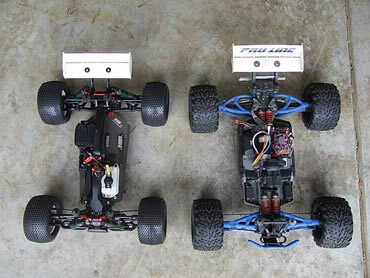 Take a close look at the bottom of both chassis; do you notice the E-Revo is higher? I assume that the Matrix TR will handle a lot better while the E-Revo would be great for bashing. The next step is to build the battery box, motor and servo mounts.